MTN is here again, After introducing 1.3GB and 3.7GB some days ago, another juicy and creamy offer seems to be up coming. I know you love data and airtime that is why MTN NG got you covered. Those who have subscribed to the 1.3GB plan and 750MB for N500 plan are already testifying that its working fine. Guess What? You can now get 5GB + N2560 to call all network in Nigeria from your MTN line. I guess this offer is far better than the previous. 5GB is something big for some people and I know you’ll want to go for it. >>Send an SMS D2000 to 131 to get the offer. Its Valid for 30days. Your account will be credited with data and airtime. 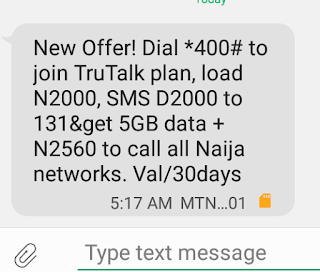 You can also get N1950 free airtime + 100MB data with just N500. Then recharge your line with N500 and SMS V500 to 131 and you will be given the data and airtime. I Love this. Why Did they take too long. To introduce this.